They are not famous, rarely get recognition, and don't consider themselves extraordinary in any way-but they are the power behind a towering empire of Chesed in our community. They are homemakers, retailers, and professionals; students, middle-agers and retirees; Chassidish, Litvish, and modern Orthodox. They are Achiezer's incredible volunteers. Achiezer paid tribute to its outstanding volunteers at a packed Evening of Appreciation on Monday evening April 22. 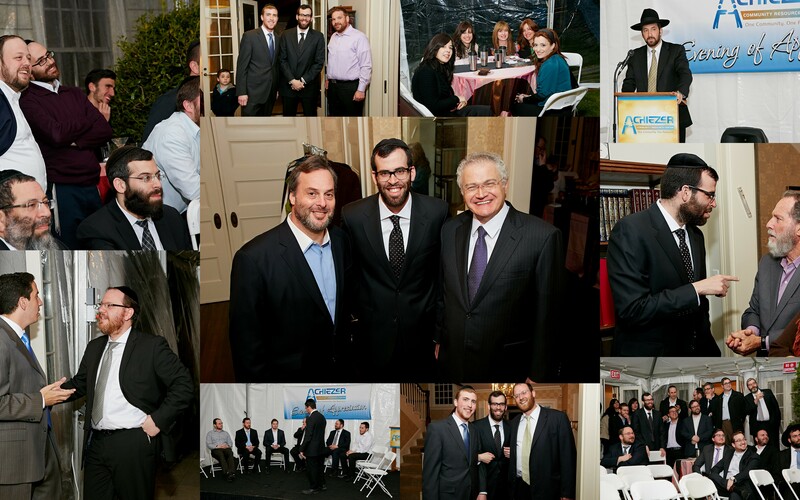 More than 150 Achiezer volunteers filled the home of Yair and Milka Keilson, to enjoy a well-deserved interlude of camaraderie, inspiration and entertainment. Following a brief welcome by Rabbi Boruch Ber Bender, Development Coordinator Eli Weiss shared some powerful impressions of the remarkable personal dedication and impact of each and every volunteer. Rabbi Zvi Ralbag of Congregation Bais Ephraim Yitzchok inspired the audience with Divrei Bracha, remarking, "Your volunteerism breeds a feeling of caring which is contagious, leading others to care as well... And while people may eventually forget the hard times, they will never forget the Chesed that was done for them during those hard times." The evening closed with an uproarious presentation by hypnotist Moshe Tawil, with hilarious antics performed by willing members of the crowd under the effects of hypnosis. Achiezer extends a tremendous vote of appreciation to Scott Fagen of Traditions for graciously sponsoring the sumptuous spread, as well as many thanks to Simply Sushi for providing the gourmet sushi rolls. Most of all, Achiezer offers its overwhelming gratitude to each and every volunteer-the quiet heroes and heroines whose unassuming, all-encompassing dedication make Chesed in our community a reality.